When we first launched Private Packagist on packagist.com it started as a SaaS offer promising an extremely fast setup and effortless maintenance. We chose to launch Private Packagist as a hosted solution first because Toran Proxy was already available to Composer users for local installation. But our plan had always been to replace Toran Proxy with a much improved on-premises version of Private Packagist. So beginning in March we started offering Private Packagist Enterprise for installation on your own infrastructure. 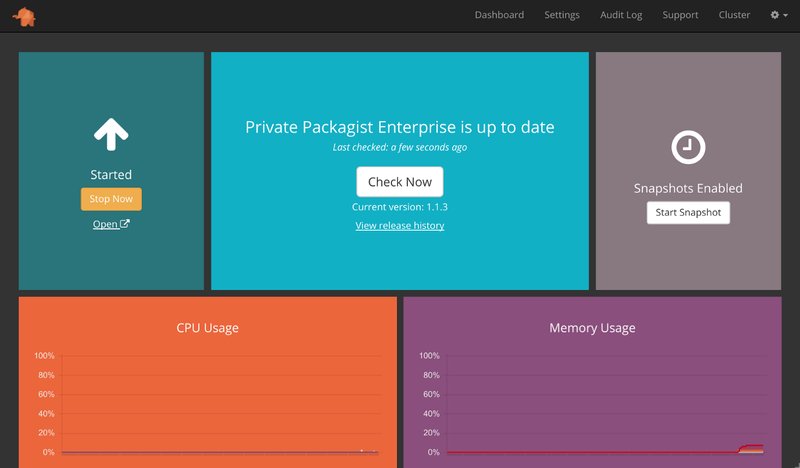 With Private Packagist Enterprise you get full control over the infrastructure Private Packagist is running on. Most notably this means that you can run it inside your VPN behind your firewall allowing it to interact with your protected source control management systems, e.g. GitHub Enterprise, Bitbucket Server / Stash or self-hosted GitLab. With the help of Replicated we can offer companies a similarly hassle-free setup and maintenance experience as on our cloud platform. All you need is a linux box matching our specs and you can run the Replicated daemon which will take care of setting up the application and allows you to manage Private Packagist through a web based management dashboard. You can create regular snapshots, update the application with a click and easily restore the application from a backup. At the end of February this year we launched our synchronization feature with Bitbucket and GitLab after only supporting GitHub for the first 3 months. It enables you to keep users, permissions and packages in sync with your private code storage reducing the configuration overhead compared to tools like Satis considerably. Automatically configured webhooks further streamline working with Composer packages. In the meantime we’ve expanded this synchronization feature for Private Packagist Enterprise. You can set up an integration with GitHub Enterprise, Bitbucket Server / Stash or self-hosted GitLab in addition to their public services. This allows your users to authenticate through these services without the need for additional passwords or permission settings. They automatically gain Composer access to the same code they have access to on your source code management system.